ST. LOUIS (AP) – The father of a black 18-year-old shot to death by a white police officer in Ferguson pleaded Sunday for a “day of silence” as he lays his son to rest Monday. The more than two weeks since Michael Brown’s death have been marked by nightly protests, some violent and chaotic, although tensions have eased in recent days. Brown Sr. told the crowd that he and his son’s mother appreciate the love and support they’ve received from the community. The Rev. 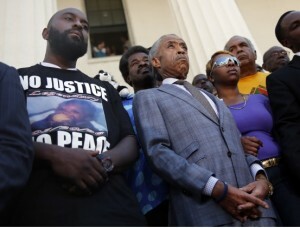 Al Sharpton, who will speak at the funeral, echoed his request for peace. via AOL.com Article – Dad of 18-year-old shot by officer asks for peace.